Nearly all plants do well in a greenhouse and bromeliads are no exception. They can also be grown in your home in windows or under artificial lights. In mild climates they can be grown outside all year. Adequate light is the most critical factor for growing healthy, colorful bromelaids. Most will grow satisfactorily if you give them 2,000 footcandles of light for 12 hours a day. They will show better form and more intense color with 3,000 footcandles... high humidity is neccessary at these higher light levels. Publications usually give out worthless recommendations regarding "full sun" or "strong light" when recomending the light needs of a plant. Full sun in Seattle is not the same as full sun in Phoenix Arizona. It is also impossible to estimate light intensity by eye. A good plant grower should invest in an inexpensive light meter. It will cost you about the same price as a decent plant but save hours, sometimes years worth of trial and error learning which plant likes what. footcandles; 1/25 second = 2,500; 1/60 second = 1,250 footcandles etc. Take readings in the morning, noon and late afternoon to determine the average intensity throughout the day. If you prefer to use Lux as the unit, multiply footcandles by ten to get lux as values. Lumens per square foot is equivalent to footcandles. Within the acceptable range for each species, higher light intensities produce more compact growth and better foliage and inflorescense color. The rule is, to give a plant as much light as it can take without burning or bleaching. Bromeliads can be grown indoors under some types of artifical light. The standard incandescent bulbs do not produce the adequate color balance for good plant growth. Fluorescent light provides the proper color range and uses less electricity.Wide-Spectrum or daylight tubes are the best of the standard types and the cool white ones are also very good. Serious growers can invest in more expensive tubes designed specifically for plants, ot in high-intensity tubes. Use fixtures that hold four or six 48-inches or longer tubes and hang them not more than two feet (60cm) above the tops of the plants... about eight or ten inches is best for bromelaids. It's also wise to invest in an inexpensive timer... set it for 12 to 16 hours a day. Temperature is not very important within a broad range. Most commonly available bromeliads will tolerate nights near freezing in winter, and days near or above 100 degrees F. in summer. Their appearance may suffer a little after several weeks in such extremes, but they will recover as soon as the temperatures moderate. For the best performance... the nights should be 50 to 60 degrees F. and the days 70 to 90 degrees F. during most of the year. A day-night differential of at least 10 degrees is also best. Most bromeliads have a special kind of photosynthesis called CAM... which requires substantial day-night temperature variations. The Guzmanias and Vrieseas tend to be less tolerant of temperature extremes, especially cold nights. There is a relationship between air circulation, humidity and heat. Curculation is mostly unimportant, as long as the air is not stuffy. Good air movement is essential at very high temperatures or at humidity levels near saturation. Plants that do well in the sun outdoors, may burn in an unshaded window, because the still air fails to conduct the heat away. Stagnent... saturated air such as occurs in a tight greenhouse or very humid climates, encourages diseases. At the other extreme, homes with air conditioning or forced heated air that has humidity levels below 20%... the plants will suffer. In such dry air, strong air circulation may actually cause leaf tips to dry out and die. Dead leaf tips are also a symptom of alkaline or salty water. The relative humidity should be 50% to 70%. The higher the temperature and the more vigorous the air movement, the higher the humidity levels should be. If you're growing bromeliads in the home, you can provide extra humidity with wet trays of gravel placed under your plants. Very high humidity seems to reduce the density of leaf scales. Since the beautiful leaf patterns of many bromeliads are created by banding of scales, plants may become less attractive under very humid conditions. Brighter light should help with this problem. Water Quality is important. Most domestic water is satisfactory for growing bromeliads... but some supplies are too salty or alkaline. The use of a good acidic, low-salt water promotes the development of show quality plants. You should be aware of what mineral salts are in your water supply for your own health as well as that of your plants. Some minerals are very harmful to plants... others less so. The agency that supplies your water can give you an analysis. Ask for the pH, hardness, sodium, and total dissolved salts and ask for an interpretation of their numbers (i.e. whether the values are high or low). Water that is hard (contains calcium or magnesium salts) or alkaline (pH above 7) deposits unsightly spots on the foliage but does no serious damage to most species (these are the same minerals that leaves spots on windows and dishes). The harder the water, the worse the spotting. Bromeliads with shiny foliage may become unattractive but, the species with very scaly, grey foliage... such as Aechmea fasciata and most tillandsias, have a tendancy not to show the hard water spots. 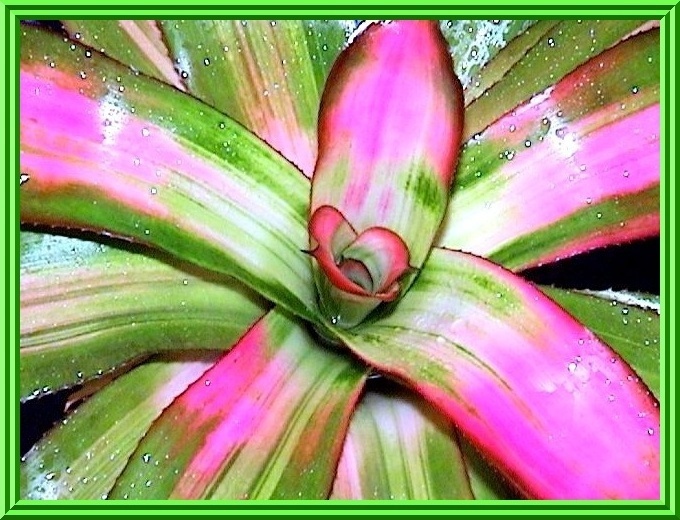 Sodium, and some other minerals... especially boron, copper and zinc, are very harmful to bromeliads. Leaf Tip Die-Back is usually one of the first symptoms. Evaporation of water from the central water reservoirs can concentrate salts enough to kill bromeliads. Artificially Softened Water is very salty (sodium); Never Use It On Bromeliads! If your water has a low to medium mineral content, flushing the central water reserviors once a week may prevent leaf tip die-back and reduce spotting. If there is still a problem, try using bottled (deionized) water or rainwater. Distilled Water is so pure, that it will pull out the nutrients from the plant tissues. Always add a little fertilizer to it. Collect and store rainwater in plastic containers, not the metal ones. Pressure Treated Lumber, which is green from being impregnated with copper compounds is Deadly to bromeliads. Do Not place it near or above where all the condensation or water runoff can drip copper-laden water onto the plants. The acidity of your water is of moderate importance. It should be acidic... with a pH of 4.0 to 7.0... 6.5 is best. Alkaline water above pH 7.0 makes essential minerals a lot less available to the plants and also contributes to spotting... but many bromeliads grow well with water up to at least pH 8.0. Some common and, many rarer species require very pure water. Those from higher elevations and the miniature species are most sensitive to salts. Water quality seems to cause little or no problems with most non-tank terrestrial species... Cryptanthus are an exception to this rule. Any potting mix is acceptable as long as its acidic... holds moisture and drains quickly. It should also be sufficiently firm to hold the plant steady. The topic of bromeliad potting mixes among gardeners creates more heated dicussions than any other topic. It's an endevour of great experimentation... mostly by trial and error. There are almost as many different potting mixes as there are gardeners. What works for one person may very well not work for the other because of the varying growing conditions. The one and only point that everyone agrees on is; potting mixes are not the same as soil. Do Not put soil into pots, it never works. The contents of any bromeliad mix are not important, only the results are. The mix must be acidic, hold the moisture and be coarse-textured to drain away the water fast and provide aeration so the roots can breathe. 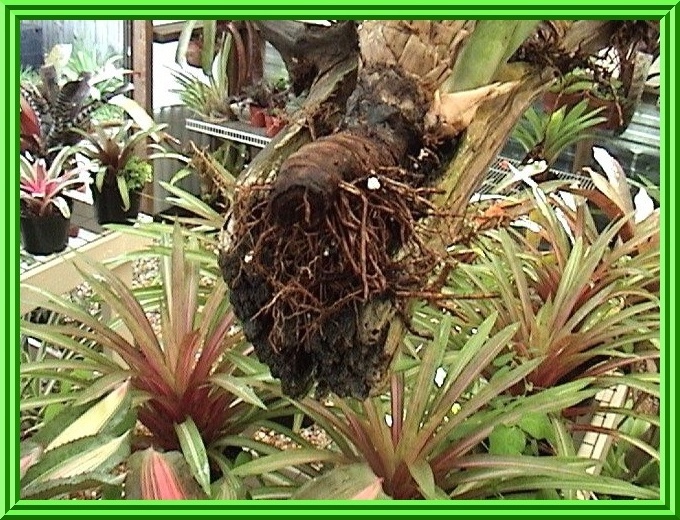 Bromeliad roots quickly suffocate in a tight, packed or saturated mix. I use a Cymbidium Orchid Mix... store bought or, mix my own at a rate of; 3 to 1... orchid bark; very coarse perlite and humis. It works good for almost all bromeliads that can be potted. Some other ingredients that can be used are pumice, lava rock, especially charcoal, coarse peat or sphagnum moss and tree fern fibers. Whatever mix you decide to use, make sure to fill the pot with it. A different layer of other materials to help the drainage, such as gravel or clay pot shards on the bottom of the pot, will actually impair drainage... not improve it. Water can not move down past a sharp boundary layer between the media of different textures until the upper layer is saturated. Saturation is exactly what you don't want. Pot type depends on your culture habits. If you grow your bromeliads in very humid climates, or have a habit of over-watering... you will have an advantage if you use clay pots or baskets that will let your mix breathe and dry out quickly. The reverse is the case for those that live in a dry or arid climate. Here, plastic or ceramic pots should be used, they will retain moisture much longer than the porus clay pots. Plants in the house with air conditioning or forced heated air, are in a micro-climate... even if its humid outside. Pot size Is important. Over potted bromeliads stay too wet, this encourages rot. Most all bromeliads have very small root systems, they should be grown in pots much smaller than a regular plant of the same size would be. A four or six inch pot is appropriate for a single plant of most species. If your bromeliad is in the correct pot size, and its become un-stable... wedge it into a larger pot, a heavier one. 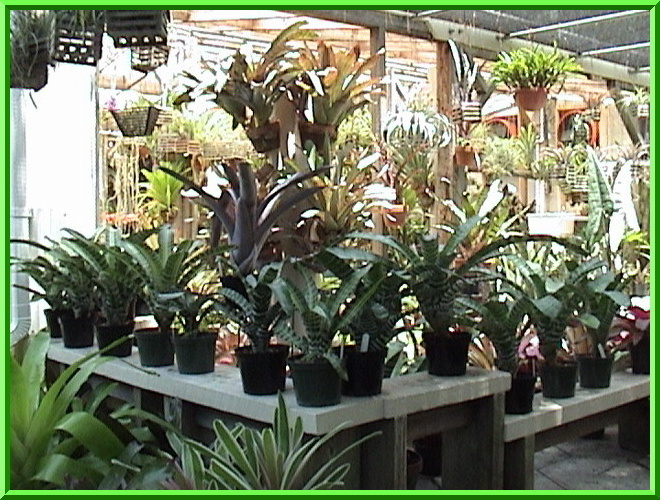 Many bromeliads can be mounted on pieces of wood or any non-toxic substrate that will last for several years. Use wood that is naturally resistant to decay, such as cork bark, manzanita, cedar or grape. Do Not use Pressure Treated Wood! For most species, a layer of moss or other water-holding medium is not necessary. It can harm some of the more arid species. The moss commonly seen on tillandsias in the stores is cosmetic... it conceals all the glue. Neoregelias "Do" benefit from moss. Smaller plants can result without it... even in very humid climates. Mounted bromeliads require a higher level of humidity and a lot more watering than the potted ones do. In dry air, the mounted plants may fail to develop sufficient roots to attach themselves to the substrate and may suffer from extreme dehydration of the foliage. There are at least three good ways to attach bromeliads to their supports. The most time consuming but permanent method is to tie the plant with nylon monofilament fishing line or strips of nylon stocking. Tie it so firmly that the plant can not wiggle, or the new roots will be broken off before they can attach themselves to the wood. This method is difficult with single plants that lack any basil stem. Bromeliads can be fastened to the substrate with Nontoxic waterproof glues, hot glue and Liquid Nails are commonly used. However, these tend to lose their grip after a couple of years, especially if the plants are soaked in water. Adhesives containing the ingredient Toluene, VM, and Pnaptha (Tilly Tacker, Shoe Goo, and Plumbers Goop) are some brand names. These are completely waterproof and will not let go. Use just enough to fasten the plant, don't bury the base of the stem in the glue or the roots can't grow through it. Bromeliads with thick woody stolons can be stapled or nailed onto the wood. Nails can be driven through the thick stolons into the wood and, the staples straddle the thinner ones. Use two nails to keep the plant from swivelling. Feed bromeliads frequently with dilute... water-soluble fertilizer, about one-eighth to one-quarter the rate specified on the label. "Air Plants" do not live on air! They require the same nutrients as all other plants do. (e.g. 30-10-10) represent the amounts of the three macronutrients in the order N-P-K. A fertilizer that contains all three is said to be a complete fertilizer. Epiphytic Bromeliads differ from plants that grow in the soil in that they absorb the minerals mostly through their leaves instead of through their roots. In nature, the rosetts collect the dust, fallen leaves, bird droppings and rain, all of which contain nutrient minerals. In addition, the water in bromeliad tanks often contain Cyanobacteria (blue-green algae), which converts gaseous, elemental nitrogen from the air into nitrogen compounds that the plants can use. In cultivation, most of these sources of nutrition are absent so bromeliads should be fed at regular intervals. Use a complete, water soluable fertilizer and drench the potting mix, foliage and central reservoirs with it. The fertilizer should be acidic, unfortunately... many brands do not clearly label this properly. It is also very important that most of the nitrogen is in the form of Ammonium or Nitrate and Not Urea! Urea can not be absorbed by the leaves and can sometimes damage bromeliads (Soil Bacteria is necessary to convert urea into a usable form of nitrogen). Fertilizers with dye can stain the grey-leafed plants, and Slow-Release fertilizers can be added to the potting medium in addition to/or instead of foliar feeding. Tank Bromeliads can be fed exclusively through the roots. Most growers recommend using one-eighth to no more than one-half the concentration in the manufacturer's directions, as full strength will damage the plant. 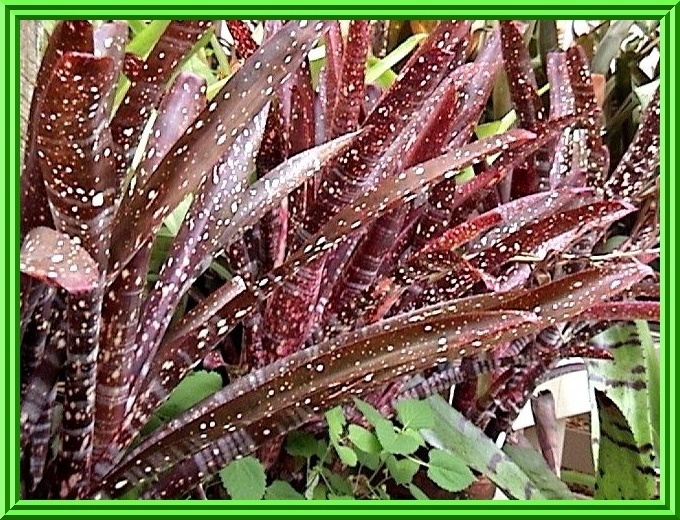 Over-fertilizing (particularly too much nitrogen) causes loss of foliage color in bromeliads and other plants as well. Neoregelias are very susceptible to such greening, so are some of the variegated cultivars of neoregelia and some other genera. Too much fertilizer will produce overgrown rosettes with very poor form. If a bromeliad gets "leggy" or "loses" foliage color, give it brighter light and less fertilizer. Excessive foliar feeding promotes growth of unsightly algae on the leaves, especially on the scaly species. In most species, the bromeliad slowly dies after blooming, but produces one to several offsets or "Pups" as its declining. Some kinds survive for several years after blooming and form huge clumps of offspring... becoming more attractive with age. Others look best as a single plant, in which case the pups should be removed from the parent plant and established on their own. Offsets are able to survive on their own when they are at least one-third the size of the mother. Often, they are beginning to grow their own roots at this size. The method of removing the offsets depends on the species and its growing habit. Some are easily popped off by grabing the pup at its base and twisting or pulling it away from the mother. Some are very firmly attached and need a more forceful means. Don't pull or twist very hard, there's a risk of crushing or breaking the meristem (growing point) near the base and the pup may die. Pull tightly attached pups away from the parent plant and cut through the offset with a sharp knife or pruning clippers. Some really tough stubborn species may require a hacksaw or even a chisel. If the pup is on a long stolon, cut through it with pruning shears or even loopers, leverage is the key here. Some bromeliads produce plantlets right on the flower spike. These can be twisted off easily when they are ready to survive on their own. Offsets of some bromeliads are enclosed in dry, hard leaf-like scales. The new roots can emerge more easily if these scales are pulled off. In cool or wet climates, its a good idea to treat the cut with a dusting sulfur or some other fungicide. If the offset has few or no roots at all, its tempting to pot it deep to keep it from falling over. This may cause the plant to rot, especially in humid conditions. Pot the base of the pup no more than one inch and brace it with some rocks or stake it until the roots can hold it in place. Keep the new plant in a shady, more humid spot for a few weeks until the cut heals and the new roots begin to grow. Keep the potting mixture rather dry at this time... if the new plant is too wet, it has no stimulus to grow new roots and the cut may become infected by fungus. Do not fertilize it until the roots are firmly rooted. Under good growing conditions, most bromeliad offsets will mature and bloom in one to two years, long after the mother plant flowers... even in a small collection, there will plants in bloom almost every year. 1. If mounting tillandsias onto wooden or cork mounts, do it well before the plant blooms. This will improve the chances of the plant sending out its roots to the mount, as floweing plants often don't do this. Instead, flowering plants are expending their energy making the flowers, then the seeds and offsets. 2. For mounting tillandsias, some prefer using cypress, cedar or grapewood, with branches that have dried out completly. This can be achieved by removing all the twigs and leaves from the branches and putting them into a shady place for 12 months to dry out. The process can be quicker by leaving the twigs and leaves attached to the branch for six weeks... the leaves draw out all the sap out of the branch drying it faster. 3. Consider re-potting bromeliads as soon as you get them. The potting mixture they had been growing in will no doubt be different than your own and could stay either too wet, or too dry for your growing conditions. If it stays too wet or soggy, there is a real risk that the plant will rot. And if they stay too dry, you will either need to water it more than your other plants, or its growth will be affected adversely. 4. If you can, delay removing the offsets until they are one-third to half the size of the parent plant. They will grow faster and be less likely to rot (or suffer from other death-inducing problems), than pups removed at a smaller size. The downsize of this is, that the plant may in fact produce fewer offsets than if they were removed at an earlier stage of their development. 5. Try to avoid removing the pups until winter is definitely over with. Offsets removed in the warmer months will develop roots and start their active growth more quickly than pups removed during the winter. Losses due to rot and other problems are also less likely. 6. Before applying liquid fertilizer to bromeliads, throughly wet the leaves with water, this helps to ensure the leaves are in their best condition to absorb the nutrients in the liquid fertilizer. *** A potting mixture which stays wet and soggy for any length of time, will probably cause you more problems than a mixture that has a tendency to be on the dry side. *** You may only experience some adverse weather conditions (e.g. a wet spell of some duration in winter) once in several years. However, if your potting mixture isn't made with these conditions in mind, you can suffer a lot of plant loss when they do occur. 8. If you are thinking of building a shadehouse, it would be best to build it in the fall or early winter. Not only will it be more comfortable to build it then, rather in the hot months of summer, but your shadehouse will be ready to house the Spring "Explosion" in bromeliad numbers due to your potting of offsets and getting new plants. 9. There is no need to root pups in a special potting mixture. Just plant them in the regular potting mixture you use for that type of bromeliad. 10. Many bromeliad species like high levels of sunlight, but very few can tolerate full sun in the middle of summer. If a bromeliad of a light-loving species has been growing in shady conditions, moving it straight into a well-lit position will result in sun damage, e.g. yellowing of the leaves, bleached "spots" on the leaves. Give the plant time to adjust by moving it over several weeks into progressively more sunny locations. 11. Some bromeliads never seem to flower, even though they appear to be mature. 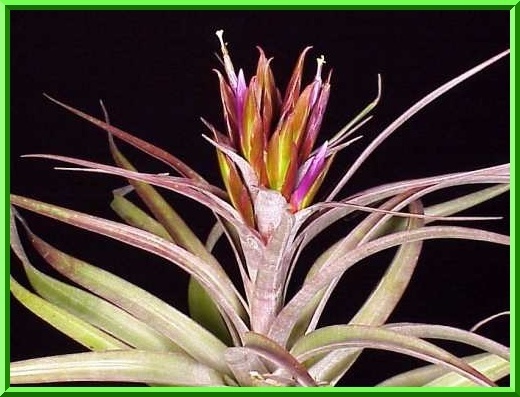 Shifting them to a new location, where they can recieve more or less light, or changing the potting mixture in which they are growing in, may induce a mature bromeliad into flowering.